Wireless N routers: what's the hardware to buy? Wireless routers are everywhere these days. Sign up with most ISPs and they'll even give you one for free – why would you need anything more? Well, let's see. We'll randomly pick one of the UK's biggest ISPs: Be. It provides an excellent service, but the free router is very basic. It's an 802.11g model, with no support for the newly ratified N standard, so performance will be hobbled. Anything with an 802.11n adaptor could be running at less than half its possible speed, and you'll probably have worse range, too. We're not having a dig at Be, though – this is more or less the standard across all the free routers out there. ISP-provided models often do things like not allowing you access to important settings, or using a 10/100Mbps Ethernet port even if your computer is using a Gigabit Ethernet adaptor. Performance is only part of the problem, though. Another is that the routers are using old technology, a particular issue when it comes to security. You should be encrypting your transmissions using the latest WPA2 standard, for instance, but even though it's been around for five years, most free routers support only the easily cracked WEP and outdated WPA standards. Firewalls, intrusion detection and other security features are likely to be similarly outdated, and sticking with a freebie router means you'll probably miss out on a whole range of possible benefits, including web traffic prioritising, printer sharing, network storage, VPN support and port forwarding. Relying on free hardware carries a real cost, then, and if you'd like to have a faster, more secure and better-managed network, you'll almost certainly be better off with an upgrade. But be careful – there are plenty of issues to consider first. Router manufacturers have been working hard to improve the range of their products in recent years, and if you have a large house or like to browse the web in the garden, this sounds like a good move. But there's a downside. If you live in an urban environment, many of your neighbours will also have wireless networks – and the greater their range, the more likely they are to cause interference, slowing you down. We carried out a few scans in the suburbs of Leicester and found that most locations had at least 10 Wi-Fi networks within range, while several had 20 or more. The highest we recorded was 33. That much competition for bandwidth will guarantee performance problems. You could use Inssider or a similar free tool to scan your neighbourhood for other networks, and change your network's channel to avoid some of them. But there are only three non-overlapping channels available for 2.4GHz Wi-Fi (1, 6 and 11), so if you have more than four networks within range there may still be clashes. And that's before you consider interference from other devices that operate at the same frequency: microwave ovens, cordless phones, baby monitors and so on. A better idea may be to abandon the 2.4GHz band altogether and buy a dual-band 802.11n wireless device that operates at 5GHz as well. Not only does this offer you more bandwidth, with eight non-overlapping channels rather than three, but there's also much less competition for it – so you should see immediate benefits in crowded urban environments. The downside of the 5GHz band is that its higher frequency doesn't have the same range as 2.4GHz 802.11n devices. It normally has far better coverage than standard 802.11g hardware, though, so if you're moving up from a free 802.11g router then this shouldn't be an issue. And even if it doesn't work out for some reason, then because this is dual-band hardware, you'll be able to switch back to 2.4GHz any time you want. There's plenty to like about this new technology, but be careful – not every dual-band router is the same. The Linksys WRT320N, for instance, is marketed as dual-band, and it really can work at 2.4GHz or 5GHz. But the important word here is 'or': the router has only one radio that switches from 2.4GHz to 5GHz as required.If you have a mix of technologies – both wireless G and N kit – and they're working simultaneously then this will inevitably slow you down. A better option is to look for a router that's dual-radio as well as dual-band. The Linksys WRT610N is a perfect example. It includes 2.4GHz and 5GHz radios that can transmit and receive at full speed simultaneously, so there's no time wasted switching bands, and your adaptors always have the router's full attention. The number of radios is one of the most important hardware features of a router, but there are others worth considering. Take a look at the antennas, for instance. If these are inside the case then the router will be a smaller, more compact package. However, external antennas that use a standard connection (look for a common connector type, such as RP SMA) will be upgradeable, and that could help you squeeze more performance and range out of your setup. Browse a specialist store such as Wi-Fi Antennas to see what's available. Every router comes with Ethernet ports that you can use to establish a wired connection to your network. In most cases, these are regular 10/100Mbps types, but many routers now include Gigabit Ethernet ports. If your PC supports Gigabit Ethernet then this is a definite plus, especially with high-performance routers (the best 5GHz models can reach over 100Mbps), where a 10/100Mbps connection would quickly become a bottleneck. Connection to the outside world will be via a conventional phone cable if the router includes a broadband modem. In that case, there's not too much to say: as long as it supports ADSL2+ (all current routers do) then it'll get you online with the minimum of hassle. If you have an ADSL2+ or cable modem already, though, or maybe want to connect both, then pay attention to extra WAN options. Billion routers are particularly interesting here. 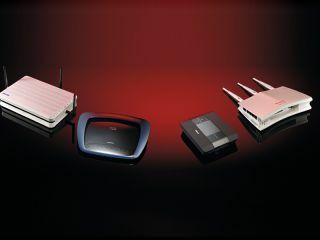 The BiPAC 7800N, for instance, features an ADSL2+ port and a separate WAN port to add another cable modem, fibre connection, extra ADSL2+ line or whatever you need. The new BiPAC 7800GZ comes with a builtin SIM slot: just add the appropriate card and it'll directly support 3G connections too (which is much easier than trying to cope with USB modems and their many compatibility issues). Current page: Wireless N routers: what's the hardware to buy?